"Lasagna" redirects here. For other uses, see Lasagna (disambiguation). Lasagne (/ləˈzɑːnjə, -ˈsɑːn-/, also UK: /-ˈzæn-, -ˈsæn-/, Italian: [laˈzaɲɲe]; singular lasagna) are a type of wide, flat pasta, possibly one of the oldest types of pasta. Lasagne, or the singular lasagna, commonly refers to a culinary dish made with stacked layers of pasta alternated with sauces and ingredients such as meats, vegetables and cheese, and sometimes topped with melted grated cheese. Typically, the cooked pasta is assembled with the other ingredients and then baked in an oven. The resulting lasagne casserole is cut into single-serving square portions. Lasagne originated in Italy during the Middle Ages and has traditionally been ascribed to the city of Naples. The first recorded recipe was set down in the early 14th-century Liber de Coquina (The Book of Cookery). It bore only a slight resemblance to the later traditional form of lasagne, featuring a fermented dough flattened into a thin sheet, boiled, sprinkled with cheese and spices, and then eaten with the use of a small pointed stick. Recipes written in the century following the Liber de Coquina recommended boiling the pasta in chicken broth and dressing it with cheese and chicken fat. In a recipe adapted for the Lenten fast, walnuts were recommended. The traditional lasagne of Naples, lasagne di carnevale, is layered with local sausage, small fried meatballs, hard-boiled eggs, ricotta and mozzarella cheeses, and sauced with a Neapolitan ragù, a meat sauce. Lasagne al forno, layered with a thicker ragù and Béchamel sauce, and corresponding to the most common version of the dish outside Italy, is traditionally associated with the Emilia-Romagna region of Italy. In other regions, lasagne can be made with various combinations of ricotta or mozzarella cheese, tomato sauce, meats (e.g., ground beef, pork or chicken), and vegetables (e.g., spinach, zucchini, olives, mushrooms), and the dish is typically flavoured with wine, garlic, onion, and oregano. In all cases, the lasagne is oven-baked (al forno). Traditionally, pasta dough prepared in Southern Italy used semolina and water; in the northern regions, where semolina was not available, flour and eggs were used. In modern Italy, since the only type of wheat allowed for commercially sold pasta is durum wheat, commercial lasagne are made of semolina from durum wheat. Emilia-Romagna's intensive farming economy in the northern region of Italy results in plentiful dairy and meat products, and a commonality in regional cooking – more so than the olive oil found in southern regions of Italy. Pastas from Emilia-Romagna and its capital, Bologna, are almost always served with a ragù, a thick sauce made from ingredients such as onions, carrots, finely ground pork and beef, celery, butter, and tomatoes. In Ancient Rome, there was a dish similar to a traditional lasagne called lasana or lasanum (Latin for 'container' or 'pot') described in the book De re coquinaria by Marcus Gavius Apicius, but the word could have a more ancient origin. 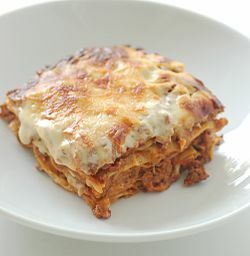 The first theory is that lasagne comes from Greek λάγανον (laganon), a flat sheet of pasta dough cut into strips. The word λαγάνα (lagana) is still used in Greek to mean a flat thin type of unleavened bread baked for the holiday Clean Monday. Another theory is that the word lasagne comes from the Greek λάσανα (lasana) or λάσανον (lasanon) meaning 'trivet', 'stand for a pot' or 'chamber pot'. The Romans borrowed the word as lasanum, meaning 'cooking pot'. The Italians used the word to refer to the cookware in which lasagne is made. Later, the food took on the name of the serving dish. Another proposed link, or reference, is the 14th-century English dish loseyn as described in The Forme of Cury, a cookbook prepared by "the chief Master Cooks of King Richard II", which included English recipes as well as dishes influenced by Spanish, French, Italian, and Arab cuisines. This dish has similarities to modern lasagne in both its recipe, which features a layering of ingredients between pasta sheets, and its name. An important difference is the lack of tomatoes, which did not arrive in Europe until after Columbus reached America in 1492. The earliest discussion of the tomato in European literature appeared in a herbal written in 1544 by Pietro Andrea Mattioli, while the earliest cookbook found with tomato recipes was published in Naples in 1692, but the author had apparently obtained these recipes from Spanish sources. As with most other types of pasta, the Italian word is a plural form: lasagne meaning more than one sheet of lasagna, though in many other languages a derivative of the singular word lasagna is used for the popular baked pasta dish. Regional usage in Italy, when referring to the baked dish, favours the plural form lasagne in the north of the country and the singular lasagna in the south. The former, plural usage has influenced the usual spelling found in British English, while the southern Italian, singular usage has influenced the spelling often used in American English. King Ranch chicken – a casserole also known as "Texas Lasagna"
^ "Lasagna". Merriam-Webster. Retrieved 30 June 2017. ^ Del Conte, Anna (December 1, 2013). Gastronomy of Italy. Pavilion. ISBN 978-1862059580. ^ "Presidential Decree 187" (PDF). translation from UA A.F.P.A. 9 February 2001. Retrieved 7 October 2012. ^ Hess, Reinhardt; Sälzer, Sabine (1999). Regional Italian cuisine: typical recipes and culinary impressions from all regions. Barron's. ISBN 9780764151590. OCLC 42786762. ^ Root, Waverley. The Cooking of Italy. New York: Time-Life, 1968. Print. ^ Dalby, Andrew (2003). Food in the ancient world from A to Z. London: Routledge. ISBN 9780415232593. OCLC 892612150. ^ "The Origins of pasta". The Real Italian Pasta. Retrieved 2017-03-10. ^ "lasagna". Merriam-Webster's Online Dictionary. Retrieved 2017-03-10. ^ Lewis, Charlton T.; Short, Charles. "lăsănum". A Latin Dictionary. Perseus Digital Library. Retrieved 2017-03-10. ^ "Loseyns (Lozenges)". Celtnet. Dyfed Lloyd Evans. Archived from the original on 5 December 2012. Retrieved 24 March 2012. ^ John Rylands University Library of Manchester (1996). Things sweet to taste : selections from the Forme of cury: a fourteenth-century cookery book in the John Rylands Library. John Rylands Library. ISBN 0863731341. OCLC 643512620. Thys fourme of cury ys compyled of þe mayster cokes of kyng Richard þe secund ... by assent of Maysters of physik and of phylosophye. ^ Bouchut, Marie Josèphe Moncorgé; Bailey, Ian (trans. ); Hunt, Leah (trans.). "Oldcook : Forme of Cury and cookery books in English". Retrieved 24 August 2016. ^ a b Buccini, A. F. (2013). "Lasagne, a layered history". In McWilliams (ed.). Wrapped & Stuffed Foods: Proceedings of the Oxford Symposium on Food and Cookery. Prospect. p. 95.